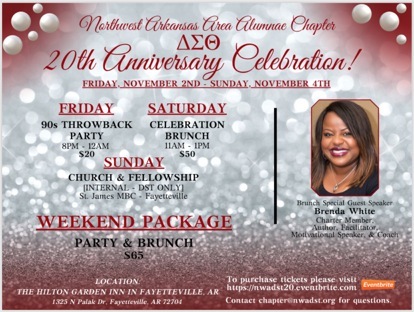 The Northwest Arkansas Area Alumnae Chapter of Delta Sigma Theta Sorority Inc. will celebrate their 20th anniversary Nov. 2-3, 2018. The weekend will entail a ’90s dance party on Nov. 2 and a brunch on Nov. 3 to celebrate the chapter’s charter members and chapter‘s accomplishments made in the Northwest Arkansas community. Both events will occur at the Hilton Garden Inn in Fayetteville. During the weekend, chapter members ask guests to donate diapers, wipes, cleaning supplies, twin sheets, and/or non-perishable food items to help support the Peace at Home Family Shelter in Fayetteville. For ticket information, please visit nwadst.org or contact Tanya Cook at chapter@nwadst.org.